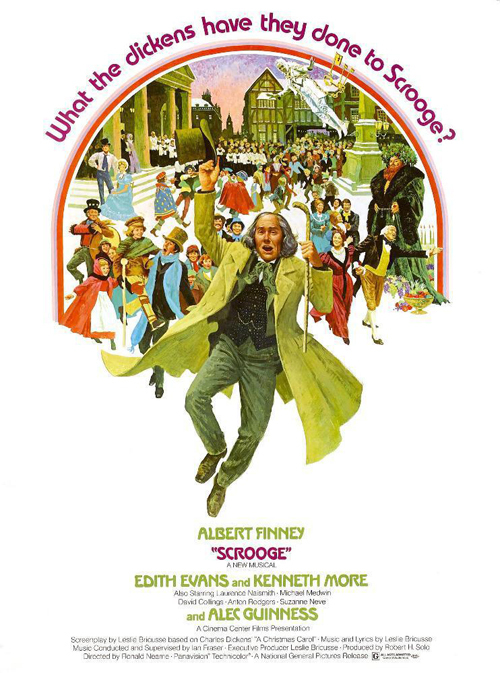 As taglines go, “What the dickens have they done to Scrooge?” is laying yourself open for invective, but the film was an easy sell to awards ceremonies, inclined as a matter of course towards sumptuous musicals. It was nominated for a BAFTA, gathered a handful of Golden Globes (I know, as meaningless as it gets, thus Albert Finney took a Best Actor award) and four Oscar noms (tellingly, none were in major categories). It’s always fun to disagree with Pauline Kael’s critiques, but she had Scrooge thoroughly banged to rights when she hauled it over the coals. She accused it of the crime of playing it tediously safe; “If you make it tastefully dull, you stand a very good chance of coming out with a picture that will be acclaimed a screen classic”. I’m not sure that has happened, but its perennial small screen presence reserves it just that kind of festive status. The fact that IMDB (a mystifying 7.5 average) seems to rate it, and that somehow – presumably because the big-screen-musical-to-stage reversal is now so commonplace – it’s oft revived for touring (Anthony Newley and Tommy Steele both took the title role), shouldn’t blur its limited appeal. “Will children enjoy it? I doubt whether they will, much” Kael answered her own question. Scrooge is the sort of Christmas movie no one sits down to watch with their undivided. They have it on in the background, so it assumes the status of slightly less static festive decor. Only slightly, though. Albert Finney had done relatively little cinema following his (rightly) acclaimed international breakout in Tom Jones, and he initially turned the Ebenezer role down (others offered the part included Richard Harris and Rex Harrison, both of whom would have been much better suited). As with Murder on the Orient Express, but much less fun – Finney doesn’t quite go ham-side up, but rather, as Kael commented “plays it glumly and realistically, a terrible mistake” – this finds the actor donning layers of makeup to accomplish an “astonishing” physical transformation. A young 33-year-old becomes an old man! But Finney’s choices weren’t in the aid of dramatic or mesmerising results, as per Brando’s Vito Corleone a couple of years later. Instead, they smacked of classic theatrical vanity, literally disguising oneself with one’s art; his performance suggests Alfred Steptoe sucking a lemon while encountering the first stages of a stroke. Even Bill Oddie did a more convincing old man – old Bill – in The Goodies episode The End. And he wasn’t trying. The less-than-compelling casting extends to his strangely under-amped support. Alec Guinness (who really didn’t enjoy the experience, understandably, as the flying harness gave him a double hernia) is okay, but that’s about the worst thing you can say about one of his performances. Kenneth More barely registers as the Ghost of Christmas Present, but his fake beard partly makes up for it. Nephew Fred is chipper, but that’s about it (Michael Medwin, 13 years older than Finney and in desperate need of rejuvenating cream to convince as a passably flourishing younger man). Only David Collings manages to breathe life into the material, making a fine, moving fist of Bob Cratchit. But it isn’t enough. As for when Tiny Tim starts singing… Gawd help us, every one. Ronald Neame directs as statically and uninterestedly as only a certain strain of transatlantically-inclined British directors of the time were capable, rarely showing even a glimmer of style but somehow continually getting re-employed (Michael Anderson was another). He’d go on to make The Poseidon Adventure and Meteor, before it dawned on studios that giving him lots of cash might not yield the most compelling results (to be fair, The Poseidon Adventure made a lot of money, and as ‘70s disaster movies go, it’s one of the least offensive). When Ebenezer descends into hell, you aren’t struck by the dreadful, oppressive atmosphere so much as the polystyrene rocks. Later, for a wrap up, Scrooge even dons a Santa outfit (slightly anachronistic for a story set in 1860, but then it’s only a musical, right). It shouldn’t need saying, but if you’re angling for a great Scrooge, where there’s palpable uplift when Ebenezer turns over that new leaf, look no further than Alistair Sim’s performance in the 1951 film. You’ll be as merry as a schoolboy. As giddy as a drunken man. And the dancing will actually raise a smile.